A friend had a birthday, and I realized it had been way too long since a layer cake happened in my kitchen. 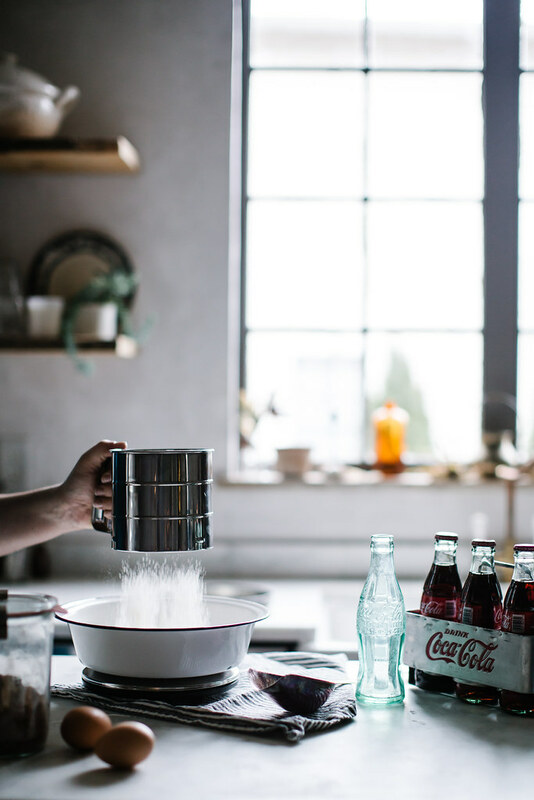 Given my southern roots, I’ve been dying to put my own spin on a southern classic, a nostalgic recipe from my childhood: the coke cake. Usually it’s a chocolate cake, but I never understood that as it never really ended up tasting like cola. Which would seem the whole point, aside from the texture the effervescence & syrup lend to the final crumb. I know you’re probably thinking that coke is a far cry from local, but for a Chattanoogan that isn’t really the case. Fact: the first Coca-Cola bottling plant in the world was right here in my hometown. As such I grew up on things like coke basted ham (my mom’s specialty which also requires French’s mustard, no fancy stuff allowed) on every holiday spread and, what you see here, coke cake. This rendition takes that traditional cake in a more vanilla spice direction…so that it actually tastes like it’s namesake. With a coke Italian meringue buttercream, the omission of the cocoa (which, as I said, I always found superfluous & overpowering), and with the exclusive use of coke as the liquid in the batter, I think I finally got what I was after. At first when I was developing this recipe I went half and half coke and buttermilk, but again it just didn’t come through. The addition of some nutmeg, cinnamon, and vanilla are designed to accentuate those spicy, mysterious flavors that end up being more than a sum of their parts. I will forever, as a cook, be fascinated by the amalgamation of flavors in coke. This cake is about making room in your culinary room for nostalgia & the fact that feast day foods can be an indulgence. It’s about the fact that food is memory as much as anything, and while some food memories do well to be rewritten, there’s nothing wrong with revisiting the emotions flavors of the past invoke. Moderation in all things. 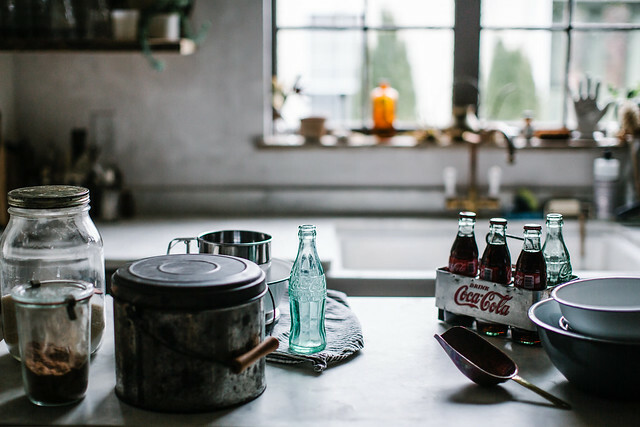 For some nostalgic, vintage inspired coke accessories to go with your cake, you can visit their store here. A thank you to them for partnering with me on this post to bring one of my favorite food memories to you guys. All opinions and recipes, as always, are my own. 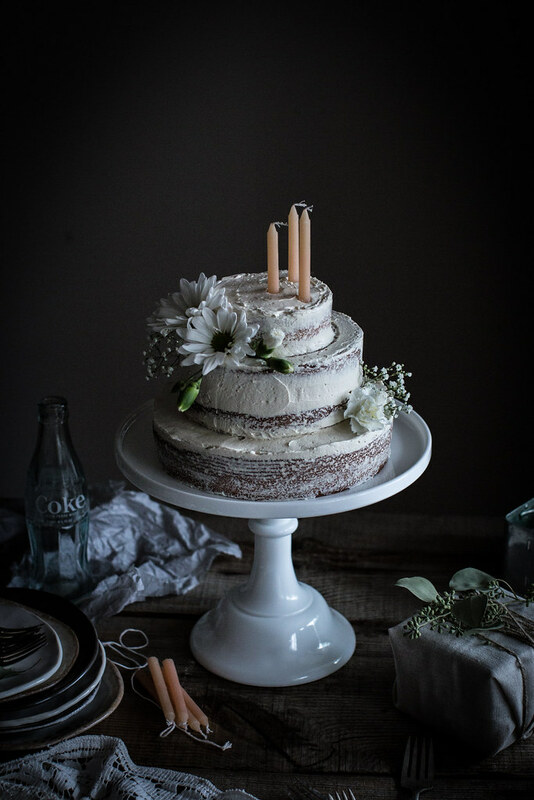 A southern nostalgia piece, this is twist on both the traditional coke cake & the traditional vanilla birthday cake. A little bit of spice really brings out that unique cola flavor, and I highly recommend using Mexican coke (cane sugar coke) if you can get your hands on it. It's usually available at most latin groceries. Heat oven to 350° F and put a rack in the center. Grease two 9" round cake pans (or whichever cake pans you'd like to use), line with parchment, and then grease again. In a mixing bowl whisk together the flour, baking powder, salt, nutmeg, and cinnamon until well combined. Meanwhile, in the bowl of a stand mixer fitted with the paddle attachment, beat the sugar and the butter until very light and fluffy, at least 8 minutes. Scrape down the bowl half way through. Add the eggs one by one to the butter mixture with the mixer on low, fully incorporating one before adding the next. Add the vanilla. Add about a third of the flour, then a third of the coke, repeat until they're both all added. After the last addition, turn the mixer off and finish mixing gently by hand with a rubber spatula, making sure to scrape the bottom of the bowl. Divide the batter between 2 9" cake pans, about 26 ounces of batter per pan. Bake on the center rack for 25-30 minutes or until a cake tester inserted in the center comes out clean. Allow cakes to cool for about ten minutes in the pan and then invert onto cooling racks. To make the frosting rub down the bowl of a stand mixer with a wedge of lemon, and then whip the egg whites & a pinch of cream of tartar with the whisk attachment until stiff peaks form. Turn the mixer off. While the egg whites are whipping, heat the coke, sugar, and vanilla in a medium sauce pan over medium heat, stirring to dissolve the sugar. Once dissolved, turn the heat to high and boil until it reaches the soft ball stage or 240° F on a candy thermometer. With the mixer on low slowly pour the hot syrup into the stiff egg whites, increasing the speed to medium high once all the syrup has been added. Beat until the bowl is cool to the touch, and then proceed to beat in the butter bit by bit until it's all incorporated. If it appears to curdle at some point, don't worry, continue to beat until it's smooth. Be careful to not add the butter while the mixture is still warm or you'll end up with a soupy mess on your hands! Frost your cake as desired. The cakes can be frozen and the frosting can be made ahead of time, but bring to room temperature before using. I think the styling is the key here. This cake is pretty enough to be a wedding cake! That’s cool that the worlds first bottling plant was in your hometown. I have a coke bottling plant down the street from me and it’s gotta be the cutest plant ever. The building is adorable. Nothing like a stoic, ugly building at all. This looks amazing, and I am looking forward to trying it soon. Beautiful photos as always! Looks delicious! I’m pinning this to use for my husband’s next birthday (he LOVES Coke). This is, without a doubt, my favorite post you’ve shared. Love the sharing of your East Tennessee roots. I lived in the region from 1st grade to 12th grade but always identified most with my middle Tennessee birthplace that I quickly retreated back to for college. The imagery in this post is stunning; the nostalgia thick. I love it! Your photos are so incredible, I could spend hours looking at all your wonderful food photography. Love how you use such a great backlight in your pictures, so perfect for this nostalgic feeling. Your pictures are so beautiful, as always. I didn’t know a coke cake existed, yours is jusr marvelous. what an intriguing recipe. I’m not surprised it worked though. I’ve made Gin and Tonic cronuts and the tonic water in the glaze gave it an almost sherbert like taste. This looks beautiful and you’ve captured it wonderfully. I’m sure Coca-Cola are proud to have their product used in such a beautiful and imaginative way. I think my husband would die for a piece of this cake, he adores the flavour of Coca Cola. I, on the other hand cannot abide to it, except during my pregnancy when I suddenly found myself craving coke and steak, two of the things I dislike the most culinarily speaking!! 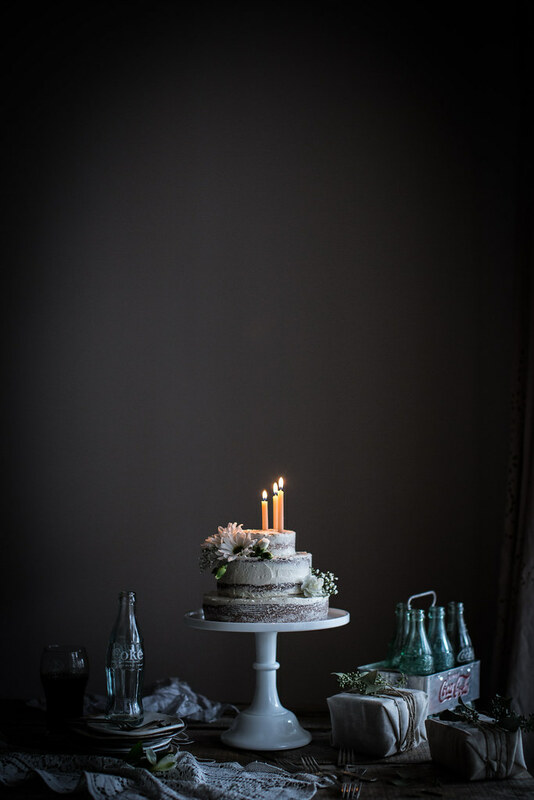 Still, the look of it is beyond gorgeous, it’s like a poem, this cake, a Brontëan poem all on its own. I literally feel excitement when I see that there is a post from Local Milk. Why do you rub the bowl with lemon before putting in your egg whites for the frosting? I have never heard of doing that before. This is the most different flavour i have ever heard!! my husband would love this so much. The beauty and elegance of your photos is astounding! That capture of the icing sugar. Wonderful. The barely there icing on the cake sides is a spectacular touch, a peekaboo look of soft lines of cake and smears of icing…. brilliant. 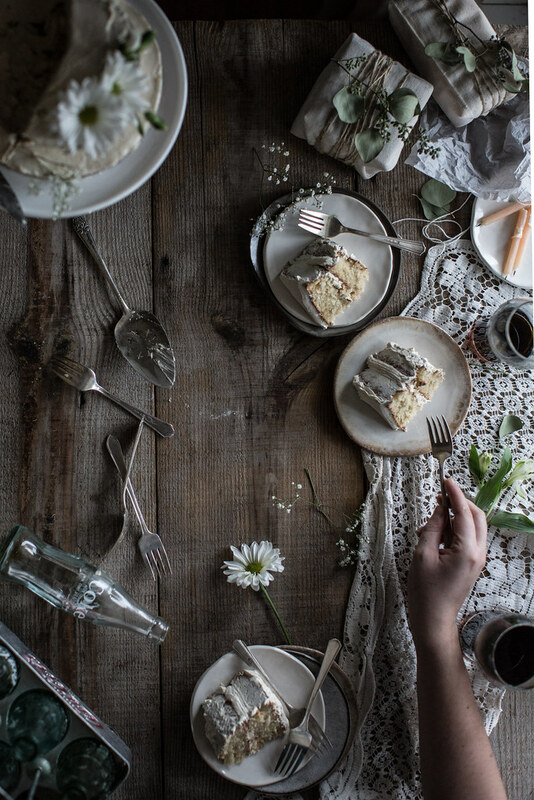 I am forever wow’d by your photos and styling, and it seems to never get old or dull no matter how many posts you write, and in a sea of homogenous looks, I so appreciate that. This looks so good! I’ve never been much of a Coke fan, but the added spices must make the taste so unique and delicious! My brother, however, is a Coke addict (as in the soda, no worries!) and I now know exactly what to make for his birthday! I’d have to pass on the rust-remover (aka Coke 😉 😛 ), but it DOES look beautiful. BEYOND. I cannot wait to make this. Like, tomorrow! What a beauty! 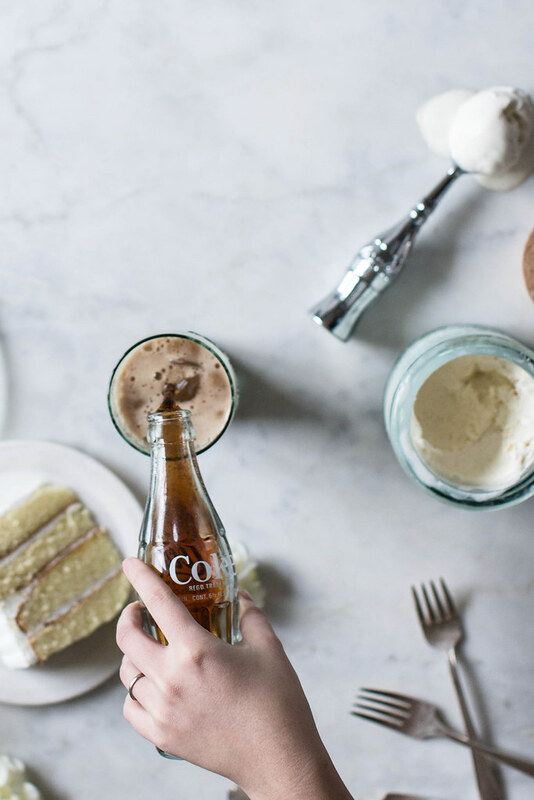 I’ve never had a coca-cola cake, and I can’t imagine what it will taste like. Love the look + the perfect inside, with the layers. I bet Pepsi is jealous! 😉 Stunning photographs! As always! I want to recive all your news and participate in your blog. Your pictures are always so beautiful and your props are amazing. It makes me wonder where you keep all of your props haha. I made this exquisite treat last night for twenty people at a Cocktails & Cake party in Nashville, TN. The texture of the frosting is like sweet, buttery clouds. What a decadent discovery. Thank you for the recipe. 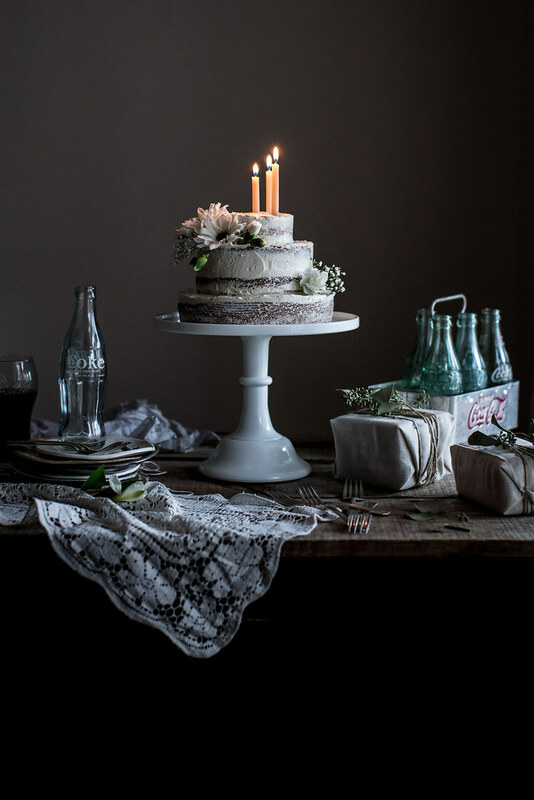 The idea of coke and cake is new to me but I love the look(Photos)! Wondering what size cake pans you used? And did you bake the three different sizes at the same time? Plan on making this next week for my mom’s 76th birthday. Would love to try and replicate yours. So pretty. Simply stunning. What an elegant treat you made based on your memories, the birthday boy or girl must have had one lucky start into his or her next year of living! . 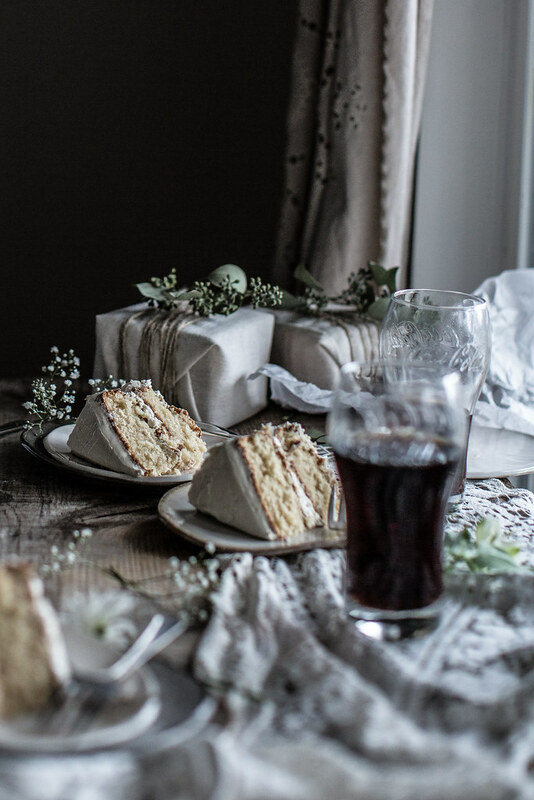 I had never thought of using coca cola for a cake, I´m really curious how that tastes… superb post, really. My friend and I loved the look of this recipe but haven’t been able to get your icing right. Every time we try it ends up a sort of curdled, soupy mess. The first time we thought we might have added the butter before the meringue was cool, but the second time we were careful to not do this and the icing still came out the same. We noticed your comment about pushing through the curdling stage, but both times we did this it just got worse and worse, until we had to throw it away. We love the taste and desperately want to figure this out! Any tips? Suggestions on what we could be doing wrong? I had the same problem as Kate! Any helpful hints? 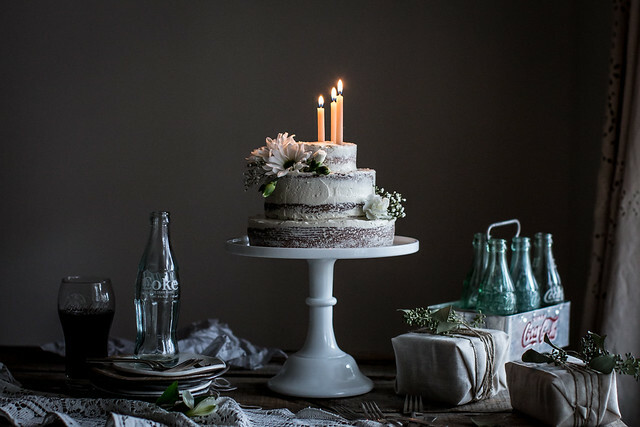 May I ask how you got a three tiered cake with two 9″ cake pans? The recipe is written to two 9″ cake pans, but you can increase the batter as needed to make a three tiered cake! Your recipe looks lovely and I am going to print it out and do it as a cupcake variation. I love that both your town and mine have “Cokelore.” Terre Haute, IN takes credit for the design of the classic Coke bottle shape, made by our own Root Glass Company. Our historical museum has a whole section of Coke memorabilia. I first found the recipe for chocolate cupcakes and like you, I thought a vanilla cake would be so much better!! 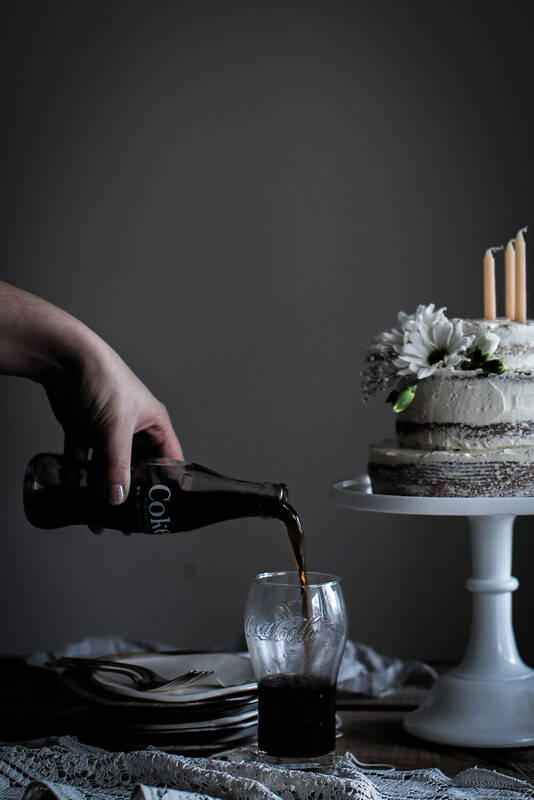 I am essentially looking for a Coke float cake! Lol.